Leading pitched roof tile manufacturer, Russell Roof Tiles has joined the elite RIBA (Royal Institute of British Architects) CPD Providers Network, investing significantly in the development and training of architects and specifiers. Joining the top manufacturers and suppliers across the UK to provide RIBA-approved training, Russell Roof Tiles’ CPD (Continuing Professional Development) Providers network membership is part of its drive to educate the market and broaden the wider understanding of pitched roofing materials and concrete roofing solutions. Having already invested heavily in new product development in the past 12 months, Russell Roof Tiles’ training forms part of RIBA’s core curriculum and will be geared towards the importance of sustainability within roofing. The programme will also take a look at the long-lasting and environment credentials of concrete tiles, in an ever-changing weather climate. The training will also touch on fixing options, emphasising the importance of products that meet today’s revised standards such as the BS 8612 - the British Standard for Dry-fixed Ridge, Hip and Verge Systems for Slating and Tiling. Not only will the training provide architects with a greater knowledge, each session will also count towards an architects’ 35 hours of CPD learning activities that RIBA Chartered Architects are required to undertake the hours every year, to maintain competence. Employing 160 staff at its two sites in Burton and a further site in Lochmaben, Russell Roof Tiles is a pioneering independent roof tile manufacturer, providing pitched roofing solutions for leading UK house builders and high-profile social housing projects, where sustainability and eco-credentials are of the utmost priority. 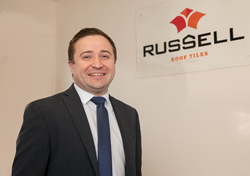 Alan Young, Regional Sales Director for Russell Roof Tiles helped the manufacturer become a member of the CPD Providers Network. He said: “With the UK seeing a significant housing demand, the need for sustainable roofing solutions has become more important than ever and we need to work with industry professionals to highlight suitable pitched roofing solutions.